The traditional Hull form transformation tools in PolyCAD were developed to demonstrate how a modern interactive user interface can be put on mature techniques enhancing design experience and productivity. 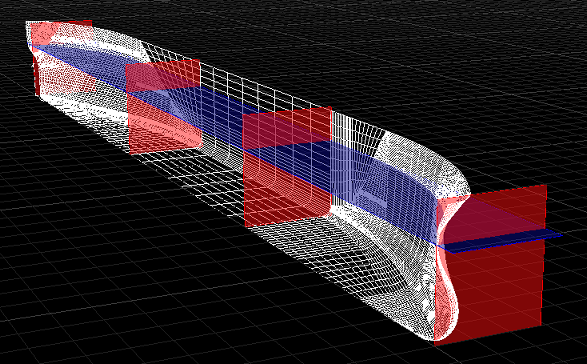 In many software applications hull transformations are implemented as separate disconnected tools, provide little feedback of how the hull geometry changes and can even destroy the definition if the transformation applied is too severe. In PolyCAD, traditional hull transformation techniques are backed up by feedback of graphical changed and comparisons of the hydrostatics with the original hull form. Each transformation is kept in a history providing the possibility to go back to an early stage and try again with different parameters. Furthermore, the original geometry is not modified and the definition is retained until a conscious choice is made by the user to overwrite the definition. Therefore, Undo is implicitly designed into this tool. Before transforming a hull form the design draught associated with the geometry needs to be defined. This can be done through the Hydrostatics or Section Area docking windows (“Dockers”). 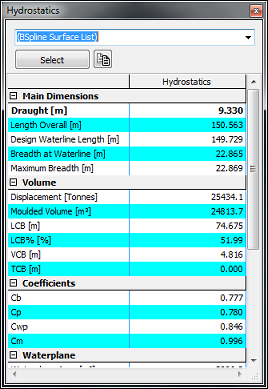 The Hydrostatics and Section Area Docker can be found in the Analysis Group of the ‘Surface’, ‘X-Topology Surface Modelling’ and ‘Hull Generation’ pages of the toolbar. To load the Hull geometry into these tools, either select the Hull Geometry with the mouse before opening the Docker or after opening these windows, select the Hull Geometry and press the Select button at the top Docker window. Note that hull geometry where the bounding box extents are within 0.05 design units of the Y=0 plane then it is considered to be symmetrical. This can be confirmed by displaying the calculation sections. Select hull geometry to be transformed and show the hull transformation tool. 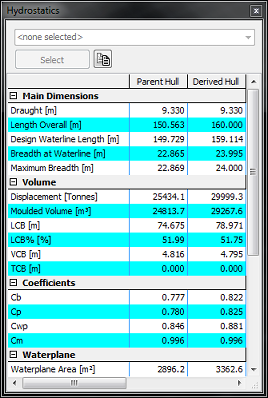 This can be found on the top toolbars under Analysis and Output -> Analysis -> Hull Transformation. This will open the hull transformation tool in the Entity Properties Docker. If this is not visible, it can be displayed using the Entity Attributes button on the toolbar (Home -> Entity Details -> Entity Attributes). 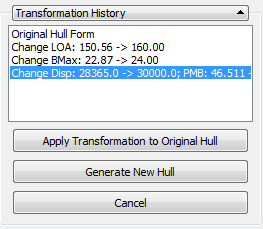 The Transformation tool begins, in ‘Original Hull Form’ mode which represents the parent hull form. If you plan to modify the hydrostatics of the hull form you will need to review the positions of the fore and aft perpendicular and the extents of the parallel middle body or position of the midship section whichever is appropriate. 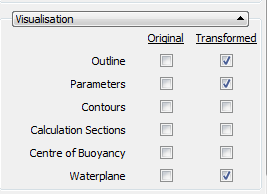 These positions are specified in the Transform Volume Distribution section of the tool and can only be modified when the ‘Original Hull Form’ state is selected. 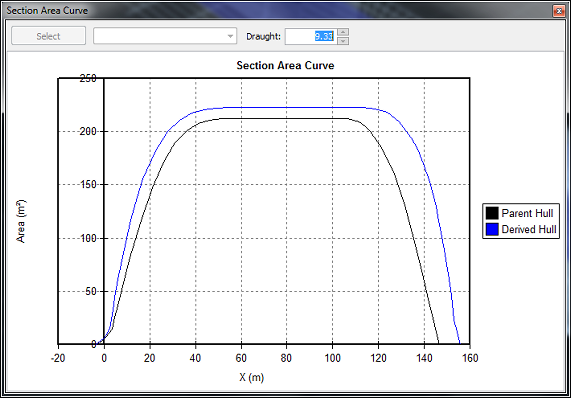 These position are initially based on the aft extent of the water plane, forward extent of the hull form and ends of the parallel middle body determined from the section area curve (within some tolerance). Initially, these may be positioned at the Aft and Fore perpendicular position depending on how you want the calculation to behave. Placing the Aft perpendicular extent on the aft extent of the Waterline and fore perpendicular on the forward end of the underwater body (bulb tip) are options. In the latter case, this may be necessary if there is a large bulb volume which produces an uncharacteristically large prismatic coefficient value in the entrance of the hull form when measured to the actual fore perpendicular location. The position of these reference locations are displayed graphically in the hull form and are also draw on the section area curve displayed in the associated Docker window. Once you have performed a transformation on the hull geometry, it is no longer possible to modify these positions. 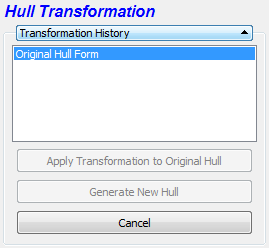 You may however, select the ‘Original Hull Form’ state to begin the transformation sequence from the beginning. Hull Transformation Stages allow you manage and review the application of several different transformations. If a transformation is undesirable, you can go back to a previous stage and reapply transformation with different parameters. Each time you apply a transformation it creates a new stage based on the previous stage. Each stage leading up to the final version is displayed in the Transformation History with text describing the applied transformation. You may go back to a previous state and apply alternative transformations with different parameters. Earlier stages are selected by clicking on them in the list and all can be selected right back to the original hull form. When a transformation is applied to an earlier stage, all subsequent stages are deleted. The Visualisation allows you to display different graphical representations of the original and currently selected stage. This highlights how the distortions are affecting the geometry. 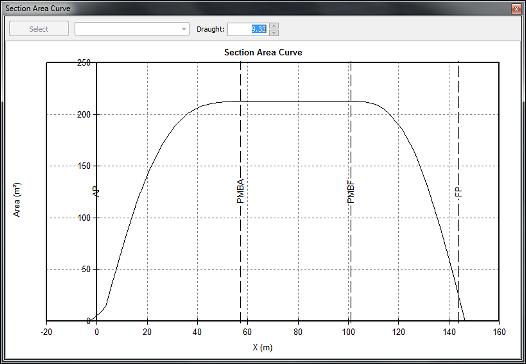 While transforming, the Hydrostatics and Section Area Curve windows, if visible, display quantitive properties of the currently selected stage along side the original hullform. 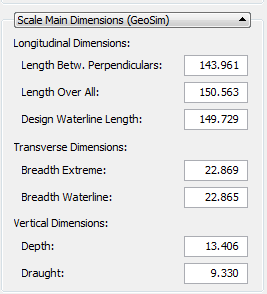 The Scale Main Dimensions (GeoSim) group provides the means to transform the extents of the hull geometry in the X, Y or Z directions. Multiple values are provided in each of these directions but the transformation is applied as a simple global linear scale. 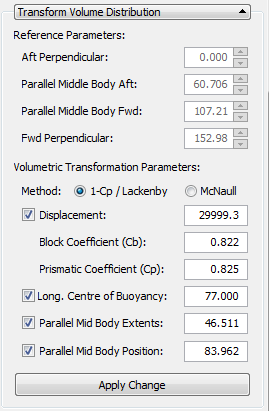 Hydrostatic transformation of the hull geometry is implemented using a combination of either the 1-Cp/Lackenby technique or the similar McNaull method. 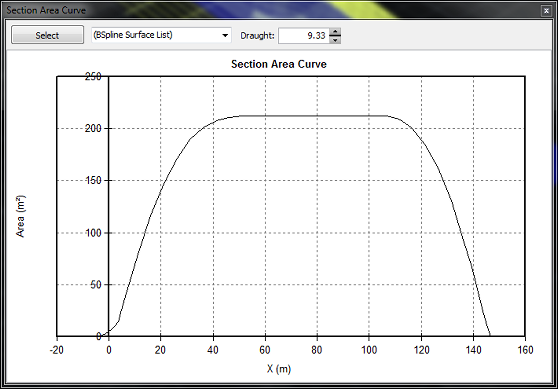 Constraints can be applied to Displacment, Longitudinal Centre of Buoyancy (LCB), Extents of Parallel Middle Body and Position of the Mid Body/Midship Section. If there is no Parallel Middle Body this option is not available. 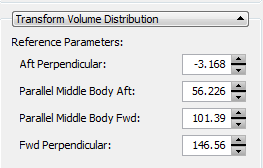 Displacement may also be constrained through Cp and Cb values. It is not possible to constrain LCB without constraining displacement. Changes are made by checking the boxes for constrained values and editing the value to make a change. Once all the changes have been entered, press the Apply Change button to transform the hull form. If the position of the Midbody is not constrained, the calculation will allow this position to move around by minimising alternative changes to the prismatic volume in the entrance and run. I.e it will avoid a situation when the entrance is increased in volume and run is decreased in volume or vice-versa. This option should be avoid in cases where there are large changes to the LCB as it can result in a undesirable large change to the position of the mid body. Once the desired hull geometry has been generated, the transformation is completed by pressing the ‘Apply Change to Original Hull’ button, which will delete and replace the original geometry or by pressing the ‘Generate New Hull’, which will create a new version of the geometry leaving the original geometry untouched.